We are excited to welcome pets home to The Belmont! dogs resembling the above breeds and/or certain Mastiff breeds. Northgate Dog Park, a favorite local spot for dogs of all ages and sizes, is only 5.2 miles away. Take your dog for a walk around Duke or at the American Tobacco Trails and enjoy miles of trails. You can also take your pet for a stroll around the neighborhood. There is scenic jogging trail around our private lake that dogs love. 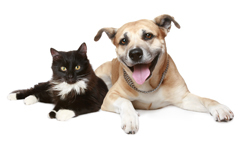 We are also pleased to offer pet stations in convenient locations throughout the community.